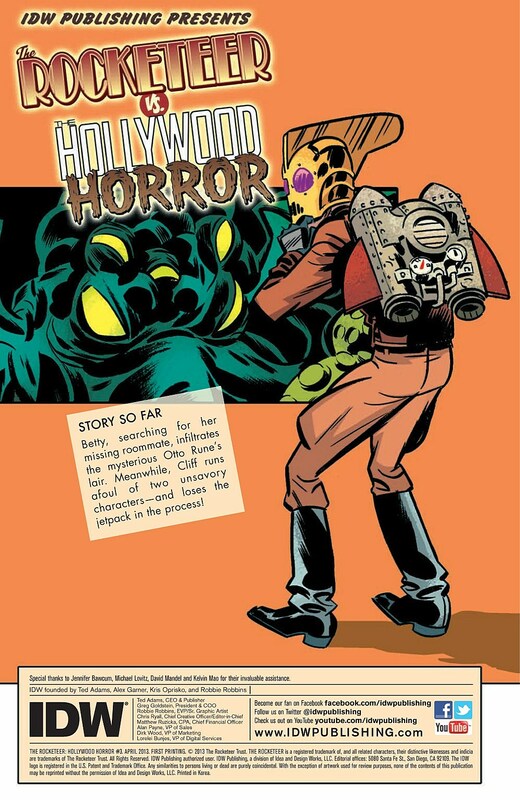 On sale this week from IDW Publishing is The Rocketeer: Hollywood Horror #3, continuing what is only the second-ever full-length Rocketeer story not written and drawn by the late, great Dave Stevens. 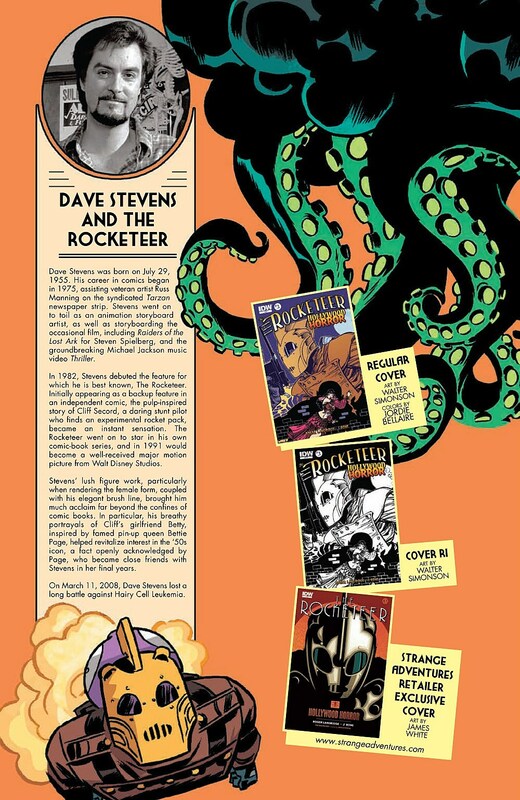 Produced in full cooperation with Stevens' estate, the new miniseries by ComicsAlliance favorites Roger Langridge (Thor: The Mighty Avenger, The Muppet Show) and J. 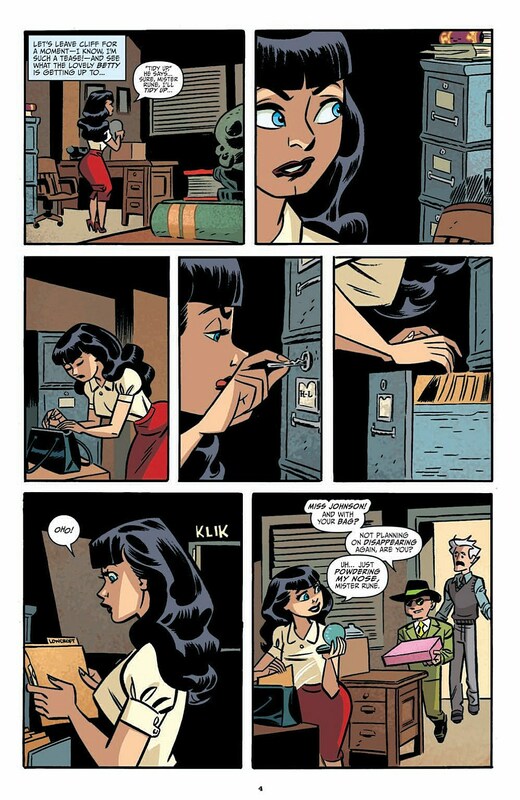 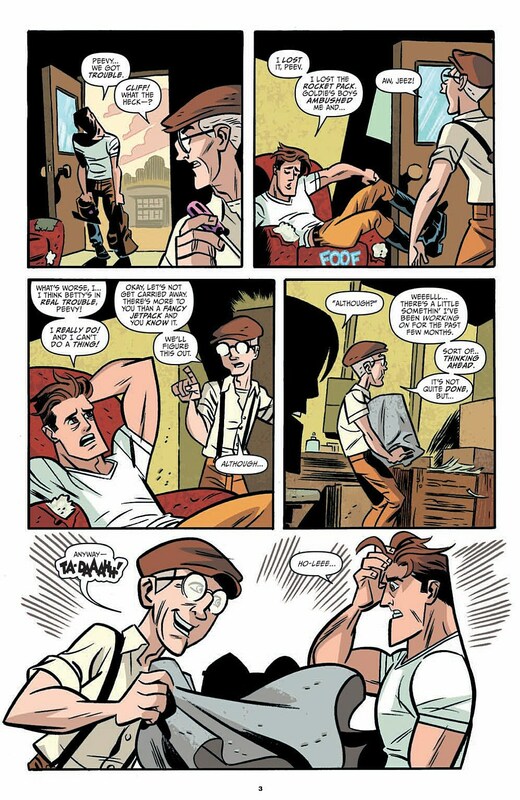 Bone (The Spirit, Wolverine/Doop) takes the Rocketeer into both familiar and unfamiliar territory with a possibly supernatural mystery that draws influence from the Golden Age of Hollywood, where the plucky model/actress Betty runs up against a creepy Hollywood cult while her boyfriend, perennial hero/screw-up Cliff, loses track of his irreplaceable Rocketeer jetpack. 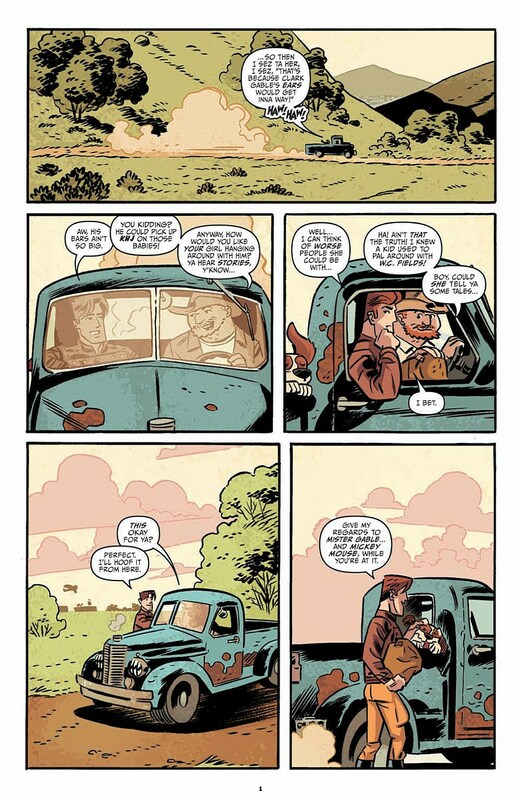 Click on to sample seven pages from the new issue, which includes the color work of Jordie Bellaire and a cover by Walt Simonson. 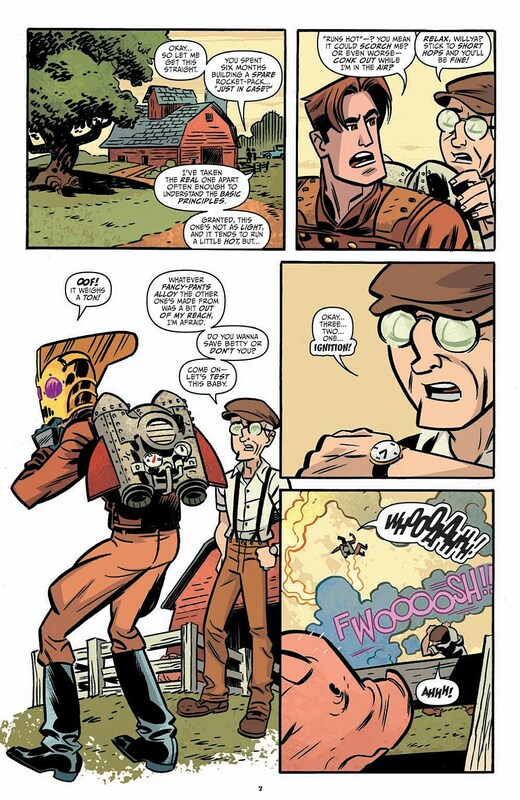 As you can see in the extended preview below, Langridge delivers a reliably funny script that Bone brings to life in his typically vivacious and inescapably cute style -- quite a tonal shift from IDW's previous long-form Rocketeer effort, the very well regarded, straight-up adventure serial Cargo of Doom by the current Daredevil of Mark Waid and Chris Samnee. 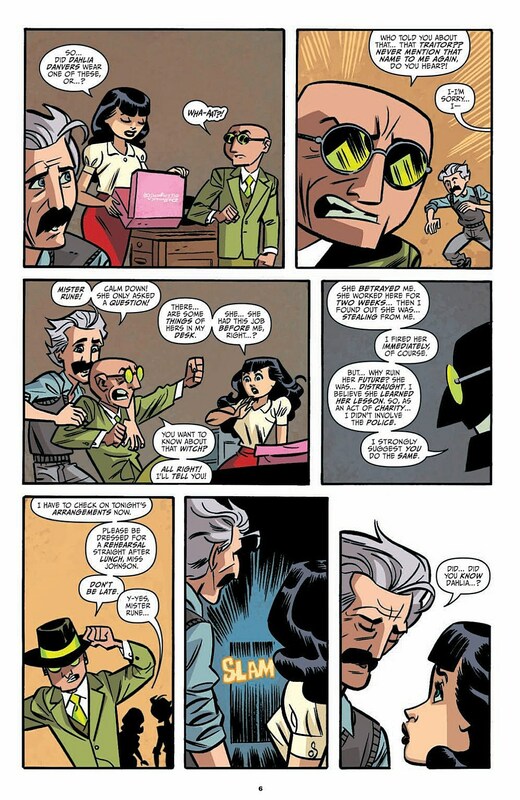 It all clicks, though, because of the great character dynamic at the heart of the Rocketeer mythos: the romance between the handsome, impertinent and ferociously jealous stunt pilot-turned-accidental-hero Cliff Seacord and his long-suffering, impossibly beautiful model/actress girlfriend Betty (designed after the iconic pin-up queen Bettie Page). 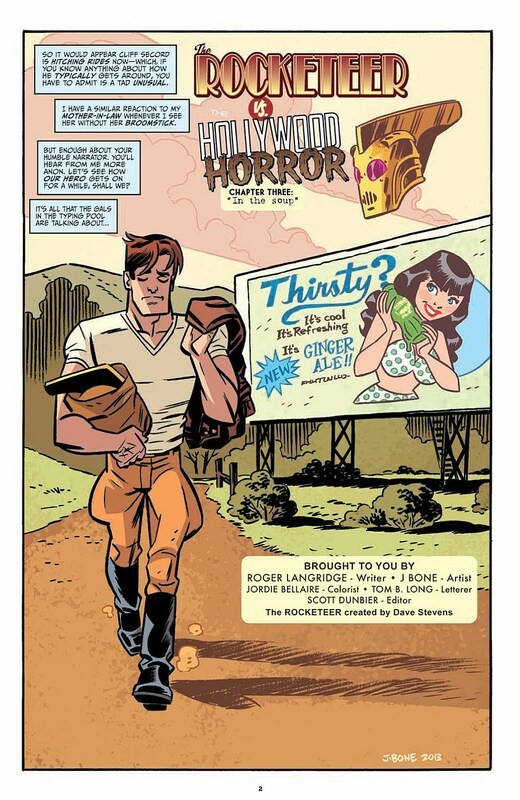 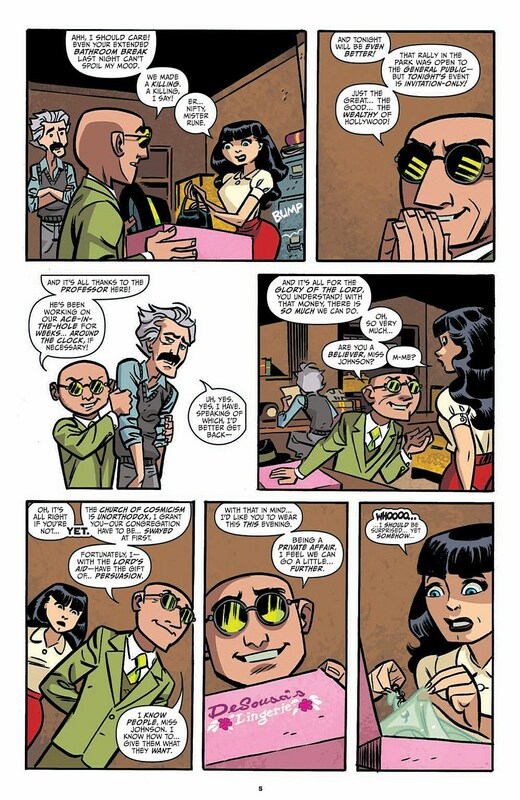 With that and Stevens' beloved pre-war setting as a foundation, talented creators can craft all manner of Rocketeer stories, as IDW editor Scott Dunbier has done in two volumes of the Rocketeer Adventures anthology and the forthcoming Rocketeer/Spirit team-up book by Waid and Paul Smith. 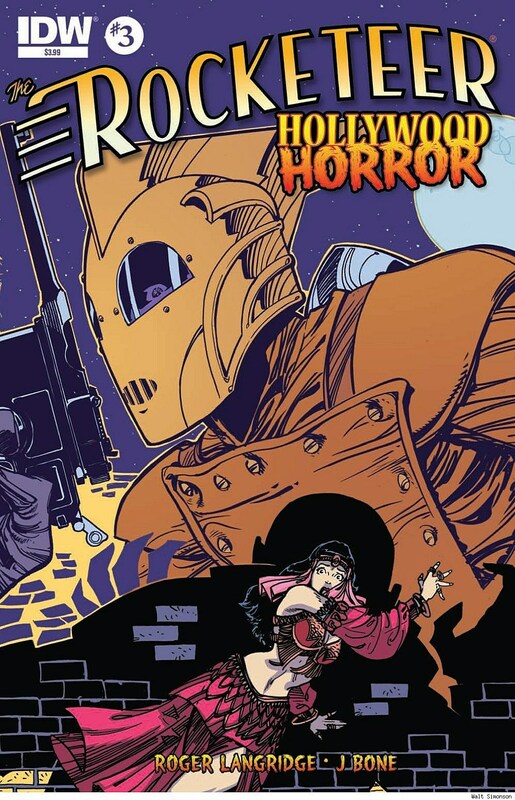 The Rocketeer: Hollywood Horror issues #1-2 are still available in finer comics shops and digitally from ComiXology, where you can also find issue #3 this Wednesday.